So my buddy, my brother and myself went down to the Arkansas river in Pueblo, CO for my second time fishing on a breezy day. My first day of fly fishing was all nymphing with eggs and worms, which worked for my first fish ever, so this time I wanted to dry fly fish. The day went pretty much like the first, a couple of hours of nothing biting and me mostly practicing my casting. So just like the first day I sit down to take a break, eat some food, and have a smoke and then get back to it. Sure enough a couple of casts later, FISH ON! 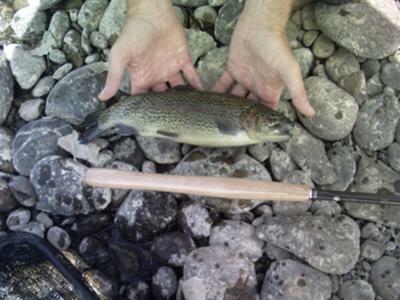 and landed a nice 13" trout! I have found my system! (Maybe I need to take more breaks?) Love the simplicity of the tenkara system and can't wait to try it in the mountains this summer. Kevin, you make it sound so easy (probably because it is)! I've never fished in Pueblo, so I can't really compare it, but I can say that you really do need to get up in the mountains this summer. The small mountain streams are what tenkara is all about, and your Iwana would be the perfect rod for most of them. If you need a recommendation for where to go, I can't think of a better place than Rocky Mountain National Park. Lots of small streams that aren't heavily fished, with lots of very willing brookies and cutthroats. The Fly Fishing Guide to Rocky Mountain National Park (on the Book and DVD page) would help you plan your trip, and I know there are at least a couple other Denver area tenkaraholics who'd probably be happy to go with you if your buddy and brother can't. Thanks Chris, I will take all the suggestions I can get about where to go or what flies to try. So feel free as a fellow Coloradoan to let me know places you like. Thanks again Chris for all the comments. Unfortunately, the "Best used by" date on my local knowledge passed long ago. 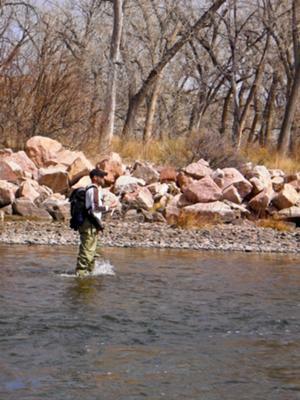 The first place I'd recommend going to is the Colorado Tenkara Anglers Facebook page. It's not real active yet but there are some good guys there who'll get you going in the right direction.